Are you looking for a way to find out what customers really think? A star rating system is a simple way to get to know your existing customers and turn potentials into new ones. Do you send out surveys or reviews but receive partially filled in answers? Or just no answers at all. It's a common problem that a lot of businesses have, and yet customer reviews are really important. Star ratings can improve your conversion rates and help you collect and analyze the data you need. They're such a simple addition to your forms. So, in this post, we'll show you just how to get it set up. Why have a rating system on your WordPress website? Star ratings are a simple, one-click function that helps to make things easier for the user. The truth is that many of us don't have the time or the will to write out detailed answers to questions businesses send out to us. Making it as easy as possible for them to answer increases the chance that they will at all. If you leave a box with a 'please tell us what you think of our product/service', you might get some answers. However, the chances are you're only going to get answers that are from one extreme or the other. People usually only take the time to write a detailed answer if they really loved your product/service, or they hated it. That means those customers in the middle, who were satisfied but are yet to be wowed are going under the radar. Ideally, you want to bring those in the middle into the 'loved your product/service' category. But you can only do that if you know about them in the first place. User ratings help you understand your users' individual preferences better and the more you know the better. With more answers from different people, and a different range of opinions, you'll get a much fuller picture of what's really going on. This information can be used to improve your business, your customer service, and will in turn boost your conversions too. Who doesn't look at star and user ratings before they make a purchase? It's often the first thing we see when we do research before buying something. Those little additions to product pages or review sites can make or break a business. In a lot of cases, you can decide to sort product page results by customer rating. People are so used to seeing and using them now that if your website doesn't have them (particularly eCommerce sites), it may mean you're missing out on potential business. Spiegel Research Center's findings on customer ratings showed that higher star ratings have a direct impact on customer conversion rates. Although, they also said that ratings that look too perfect (nothing but 5-stars) actually had a negative impact on conversion rates because they were deemed unbelievable. That's why it's so important to get accurate results from as many people as possible. How do you add a star rating system in WordPress? 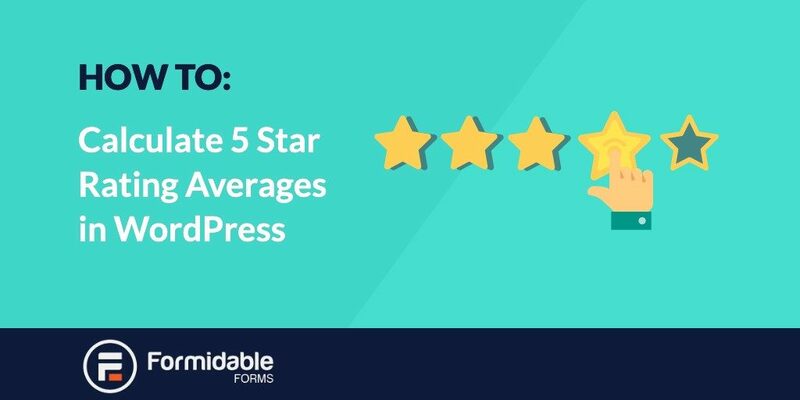 So, your next question may be: how do you add star ratings to your WordPress website? You may be looking for a special star rating plugin for WordPress. But you can do it all within Formidable Forms. We'll take you through how to do it below. The first thing you need to do is set up a field for star ratings. Create a new form, or open the one you want to add a star rating to. You should see a list of form fields on the right hand of your screen. Below you can see the Star Rating option in the bottom right hand corner. All you need to do is click on it. This will automatically add the field to your form. Next, you'll need to customize it. 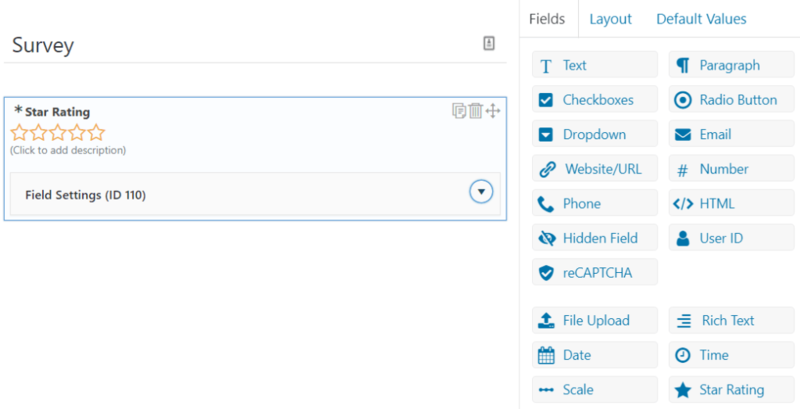 Expand the form field shown above and this will show you more options to customize the field. You can determine how many stars you would like to display by changing the 'Maximum Rating' to whatever number you would prefer. The default is set at five because that's what most people use, but it's totally up to you. You can also set the field as required* if you know you definitely want the rating when you ask for feedback from your customers. Once you're happy with your changes, it's time to publish the form and see what it looks like on the front-end. It should look something like this, with the 'Scale' part being whatever you wish to call the field. Now you know how to include and accept star ratings on your forms, what next? What do you do with this information? Having the information for yourself is one thing, but displaying that information goes one step further. You can choose to display ratings for different products or services to help potential customers make an informed purchase decision. If you wish to display your star rating on a particular page, for example a product page, follow the steps below. To add an average star rating to your page, post, View or widget, you will need to add the following shortcode. This will display an average of all the submitted ratings and will be rounded to the nearest 1/2 star. 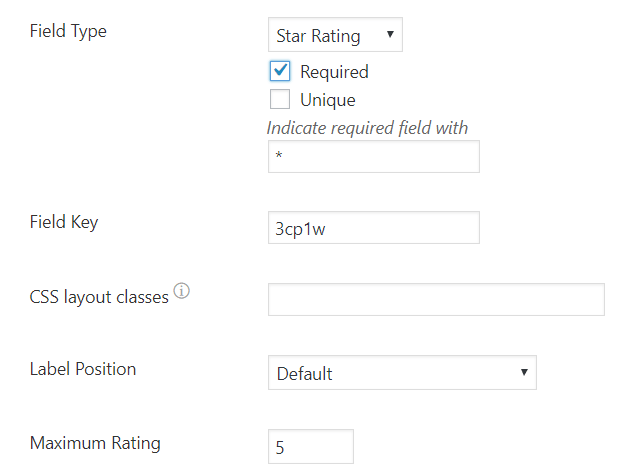 You will need to replace the X with the ID or key of the star rating field you wish to use. If you want to display this in a Formidable View, be sure to include the 'filter=limited' in your shortcode. If you do not include this part, the 'frm-stats' shortcode will show on that page instead of being replace with the star rating you want to display. With this shortcode, you'll be able to display a single rating in a View. Again, replace the X with the ID or key of the star rating field you wish to use. That's it, once you've done these simple steps you'll be good to go. We hope this has helped and that including star ratings on your website brings you positive results. If you want further customization, for example on how the star rating appear in size, take a look at our Docs on star ratings to learn more. If you're not already using Formidable Forms, and would like to learn about more features like this, take a look at our feature page or list of add-ons. We can help you create the forms you need with our easy drag and drop form builder functionality.